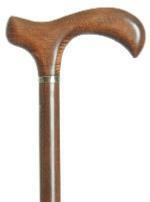 A classic walking stick suitable for everyday use. The beech wood has been stained with an attractive brown colour. The handle offers excellent support to the hand, and may be hooked over the arm when not in use. Item weight is approx. 330g.